So laments Red (Morgan Freeman) as he reflects upon his duration at Shawshank State Penitentiary. He is in jail for murder. The “only guilty man” there he informs us as narrator. The year is 1947 and banker Andy Dufresne (Tim Robbins) who has been convicted of murdering his wife and her lover, has just been admitted. He has been given two consecutive life sentences. Based on the Stephen King novella Rita Hayworth and Shawshank Redemption, the tale recounts a 20 year friendship between the two men. It is a story that is undeniably powerful as a moving portrait of camaraderie. You’d be hard pressed to find a more genuine ode to male bonding than this drama spanning two decades from 1946 to 1967. When Andy arrives, he is subject to beatings, humiliation and all manner of horrors within the prison system. He endures the harassment seemingly unfazed. Slowly he learns to adapt, utilizing his talents as an auditor to garner favor from the powers that be. In time he inspires his fellow inmates, making friends with them, in particular Red. This is the same inmate that had originally bet Andy would be the first inductee to crack upon arriving. The film is highlighted by several superlative performances. Morgan Freeman rightfully earned an Academy Award nomination for his role as Red, our narrator. He embodies the character with reverence, heart, and warmth. Freeman has never been better and that is saying quite a lot of the 5 time nominated actor who would ultimately win an Oscar for Million Dollar Baby. Tim Robbins is every bit his equal in a role that is more difficult to warm up to. If the actor appears a bit of an enigma, that is only because the character is meant to be that way. There is a quiet stoicism to his performance that recalls the great Gary Cooper. Actor Bob Gunton is a villain for the ages as Warden Samuel Norton. A stern man that exploits the prison for his own gain as low-cost labor. He presents himself as a god-fearing man, although his true nature is gradually disclosed. The depth of his evil seems to know no bounds. His reaction regarding testimony from young convict Tommy Williams is particularly memorable. The Shawshank Redemption is one of those movies whose estimation has only grown with time,. It wasn’t a box office hit in 1994, barely making back it’s production budget when initially released. However it was a critical success and received 7 Academy Award nominations of which it won absolutely NOTHING, losing Best Picture to Forrest Gump. Nevertheless, it has occupied the #1 slot as greatest film on the IMDb’s user-generated list since 2008. Like a flower that grows through a crack in the concrete, the narrative is filled with one uplifting note after another amongst the most oppressive of surroundings. There are many, but here’s my personal favorite: Andy’s letter writing efforts to secure a better library for the prison are finally rewarded with a collection of old records. In an act of defiance, Andy locks himself in the warden’s office and using the central microphone, blasts an opera record. As Mozart’s Marriage of Figaro echoes through the penitentiary, Roger Deakins cinematography captures the emotion as the inmates look upwards, embracing the audible gift. I can’t exactly describe the feeling, but the scene always reduces me to tears. 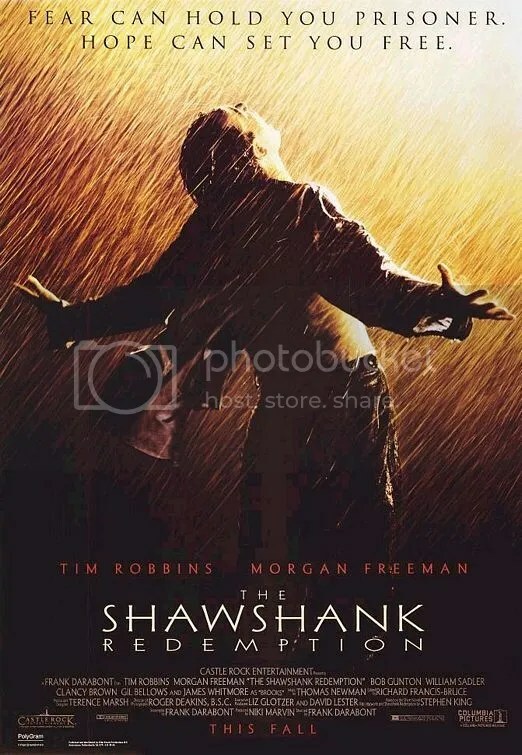 Shawshank is brimming with moments like this where the human soul triumphs over adversity in the most inspiring way. Fist of Legend is a Hong Kong action film set in Shanghai in 1937 when the city was occupied by Japanese forces. Chen Zhen (Jet Li) learns that his Chinese martial arts teacher Huo Yuanjia has died in a battle with a Japanese fighter. Distraught he leaves for China immediately to avenge his death. Upon arriving he beats Ryoichi Akutagawa, the man responsible, with such ease, he suspects foul play and this prompts an investigation that leads to, what else? More combat. This is a 1994 remake of 1972’s Fist of Fury, which starred Bruce Lee. Fist of Legend is really highlighted by some impressive fights that favor realism over wire-driven choreography. However the plot is still your standard issue mix of escalating racial tensions between the Japanese and Chinese, differing methods of rival martial arts schools, and good old fashioned revenge. This barely made a dent in Hong Kong’s box office when it was first released. I didn’t find the story to be particularly revolutionary but connoisseurs of the genre have since labeled this as one of the greatest martial arts pictures of all time. 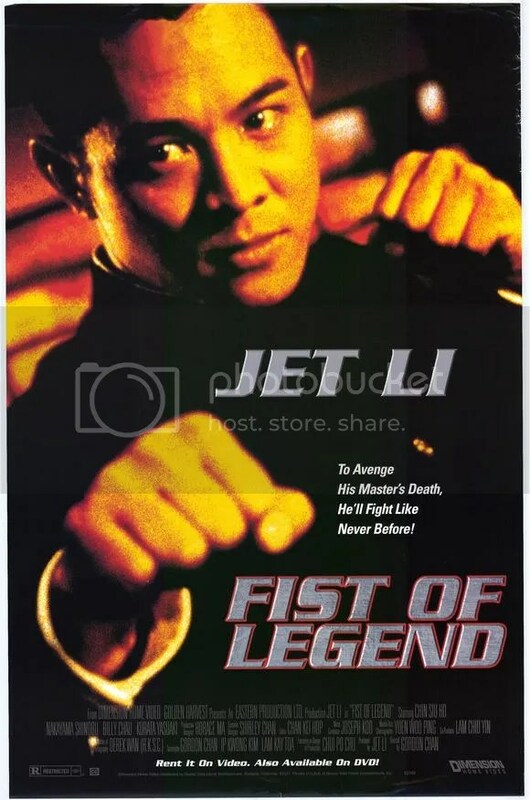 It certainly paved the way for Jet Li’s launch into Western cinema. The bouts are admittedly pretty spectacular. One especially exciting scene occurs when Jet Li visits the Japanese dojo to challenge the assailant who killed his master teacher. His many students attempt to stop him but Jet Li’s talent proves too formidable and he defeats the entire class, even taking a moment to tie his shoes in the process. Later Jet Li challenges a surprisingly sympathetic Japanese Karate Master in a field…blindfolded. And finally there’s the climatic battle where he goes against General Fujita, the Supreme Killer. Any one of these would be an incredible set piece, but taken together it’s a lot of bang for your buck. If a martial arts film is judged by the quality of its fight scenes then Fist of Legend is worth checking out. Blu-ray Notes: In the original multi-lingual movie, Cantonese and Japanese is spoken by different actors. Unfortunately there is no original language option. All 3 audio choices on the Blu-ray are dubbed: Cantonese, Mandarin or English. You’re going to get weird synchronization issues regardless of which version you chose. I can’t speak for the Chinese options, but the English voiceovers are hopelessly wooden and unnaturally stilted. I found Cantonese with English subtitles to be the most acceptable.